Feburary 08, 2011 Of all the names that fill American literary rolls, none sparks such an immediate image of hipness, spontaneity, and the unfurling road like Jack Kerouac. With last year's Film Howl, about writer Allen Ginsberg, there's been a surge of popular interest again in the beat writers, writers like Jack Kerouac. Many people know that he died in Florida, in St Petersburg. Fewer though know that the poet and writer lived in Orlando with his mother in the College Park neighborhood. That's where Kerouac received the first reviews of his classic "On the Road" and where his next work, Dharma Bums was banged out on a typewriter. That's where today's program is located. We've taken Intersection on the road to the house at 1418 Clouser Ave. 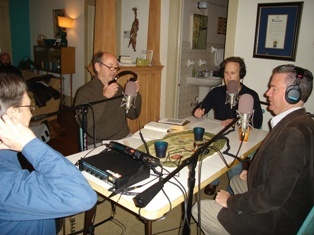 Guests Bob Kealing Co Founder of the Keroauc Writers in Residence Program and former US Poet Laureate Billy Collins join the show for a tour of Keroauc's Orlando home. 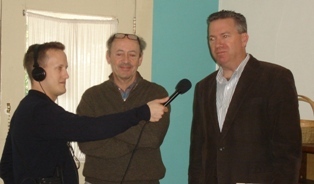 From Left to Right: 90.7s Radio Engineer Mac Dula, Billy Collins, Mark Simpson, and Bob Kealing on location at the Keroauc House.